I’ve been away gardening! The veggies aren’t in yet because I’ve been focusing on my new front yard garden. 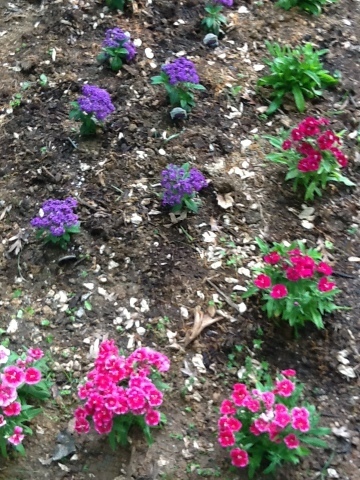 Mark and I ripped out a 3-foot by 5-foot section of grass this winter and I finally get my flower bed. A close up of my dianthus and the heliotropes. 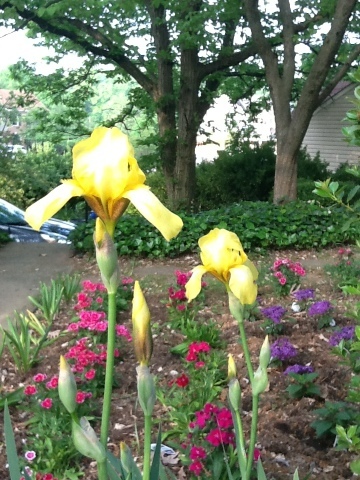 And as a great surprise this morning, my yellow irises started blooming! Aren’t they pretty? I got them as a gift from my friend Karl. He is an amazing gardener and had too many irises a few years back so he gave them to me. Now the two little plants he parted with are a nice big family. And this gem is a Pascal rose. It is a glorious white beauty. My in-laws gave it to me as a Mother’s Day gift 3 years ago when H was born. This year it has about 10 buds. It seems fitting that they are opening just around Mother’s Day this year. This guy is hidden in my back yard where I can enjoy it from the kitchen window and it gets lots of sun. 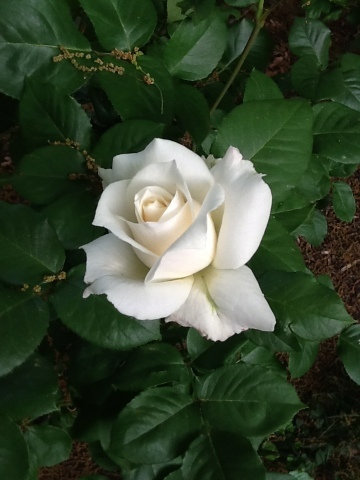 And this baby is a volunteer rose. 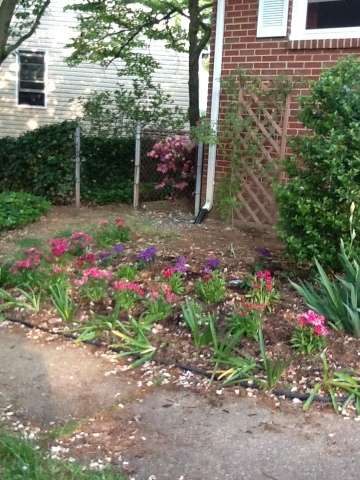 It was just a sprout next to my huge pink azalea in the side yard when we bought the house 10 years ago and I decided to let it be and see what happened. Well, now it’s huge and has these amazing dark red heritage blossoms on it. It smells as good as it looks. You can see how tall my volunteer has gotten, even with annual pruning. The fence next to it is 3-feet tall. It’s got some amazing blooms this year and promises to be covered in blooms in a week or two. 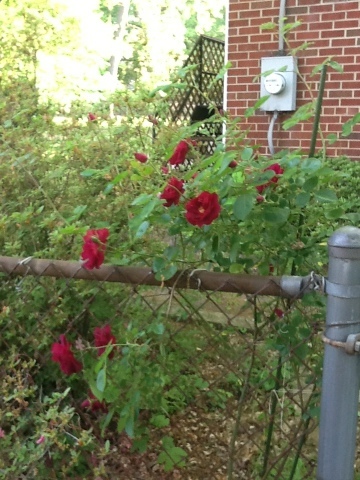 I hope my volunteer climbing rose we moved to my front yard bed looks as good as this one in a couple of years. The buds on it are considerably smaller. And as I mentioned earlier the move was hard on it. I’m convinced, though, that the garden needs a climbing rose. If this one doesn’t make it I’m going to actually buy one and plant it there with the trellis. The veggies are going in next and I’ll be posting some things about the impending patio and the heroic work Mark is doing in that part of the yard. Plus I’m still quilting away and working on that special commission. But more on that later! 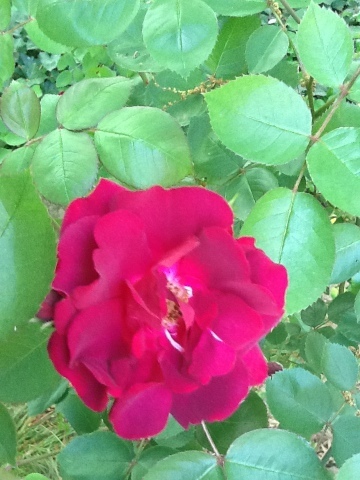 Especially since the volunteer rose bush is facing your afternoon sun.